At Tucson in 1873 the people began to appreciate that lax enforcement of law on the part of county officials made possible the escape of too many desperate criminals. So, on August 8, the population rose, more or less enmasse and took from the county jail and hanged John Willis, Leonard Cordova, Clemente Lopez and Jesus Saguaripa. A coroner’s jury summoned commended the executioners and stated that “such extreme measures seem to be the inevitable result of allowing criminals to escape the penalties of their crimes.” Willis had been found guilty of killing Robert Swoope at Adamsville in the course of a drunken discussion of the shooting of Colonel Kennedy by John Rogers, whose own fate seems to have escaped local historians. The three Mexicans, for plunder, had murdered in Tucson one of their own countrymen and his wife. The execution was without secrecy upon a common gibbet erected before the jail door, after the condemned men had been given the benefit of clergy. The people of the young town of Safford in August 1877 took the law into their own hands and hanged Oliver P. McCoy, who had acknowledged the killing of J.P. Lewis, a farmer. McCoy was to have been taken to Tucson for trial, and there was fear of miscarriage of justice in the courts. 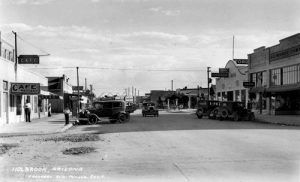 In December 1877 the people of the little village of Hackberry in Mohave County hanged Charles Rice, charged with the murder of Frank McNeil whose offense seems to have been the disarming of Rice’s friend, Robert White, in the course of an altercation in which White appeared to be in the wrong. About the time of the hanging, White, fearing a similar fate, tried to escape and was shot down and killed by his guards. At Saint Johns, in the fall of 1881, was a summary execution, a gathering of citizens taking from the jail and hanging, Joseph Waters and William Campbell, who had killed David Blanchard and J. Barrett at the Blanchard Ranch. It was told at the time that the men hanged had been hired to do the murder by someone who wanted the ranch as a trading post. But nothing was done with the third party. April 24, 1885, popular judgment was executed five miles below Holbrook, where two murderers from the town, Lyon and Reed, were run into the rocks by a posse of citizens headed by James D. Houck and killed. The couple had killed a man called Garcia. 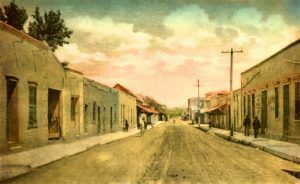 One of the most serious criminal episodes in Yuma was early in 1901 when Mrs. J.J. Burns, a farmer’s wife, was shot and killed by a Constable, H.H. Alexander, who had been charged with the service of a legal paper. About two months after the shooting, Alexander was convicted of murder and sentenced to life imprisonment. April 9, while being taken from the courthouse to the territorial penitentiary, walking between two officers, Alexander dropped dead, killed by a rifle bullet from the window of a building near by. It was assumed that a relative of the King family (to which Mrs. Burns belonged) had assumed the fullest degree of vengeance but the matter was taken no further. On December 1899, the county jail at Holbrook had a notable prisoner, George Smiley, convicted of the killing of a section foreman named McSweeney. The sheriff at that time was F.J. Wattron, a school teacher/editor, who thought to make the first legal execution in the new County of Navajo, a sort of social gathering. So he issued a cordial gilt-bordered invitation to visitors assuring those invited that the latest improved methods in the art of scientific strangulation will be employed and everything possible will be done to make the surroundings cheerful and the execution a success. There were hundreds of protesting letters over the sheriff’s levity. Governor Murphy waxed indignant, scored the sheriff for flippancy and granted the prisoner a month’s reprieve. Smiley was hanged January 8, 1900. One of Earps [Morgan I believe] was caught cheating at cards & the sheriff at the time told him there was a train going east & one going west, and he had better be on one by sundown. He ended up going to Tuson and then on to Tombstone.